Synopsis: A model prisoner with six months left to serve is transferred to a maximum security prison by a warden with an axe to grind. 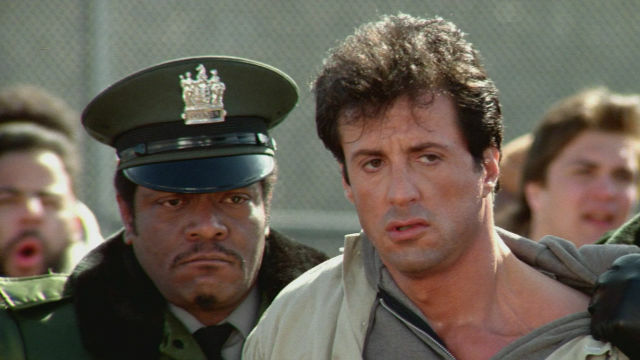 Sylvester Stallone (D-Tox, Escape Plan) is a good guy in this one, even though he’s doing time. At some point in Lock Up the reasons for his incarceration are explained – it wasn’t his fault, apparently, but I wasn’t paying sufficient attention for the reasons to sink in. Strange really, I was sitting in front of the screen and yet the information failed to penetrate… Not that it really matters. Anyway, Sly’s got six months of his sentence to go, gets weekends off to visit his sweet patootie, and the neighbourhood kids all like him, so things aren’t too bad. Anyway, Warden Don’s out to make our hero’s life hell – although he takes his own sweet time about it. 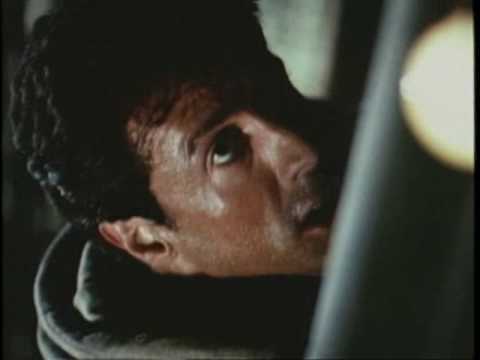 For the first forty-five minutes or so, Sly has a pretty good time of it: he makes a few mates, susses out the ones to stay away from, and gets a job in the prison garage where he and his new mates set about restoring an old motor. It’s only when one of Sly’s mates decides to go for a joy ride around the prison grounds that Don suddenly remembers why he invited Sly to stay, and a prolonged spell in solitary marks the start of a campaign of persecution designed to push Sly into committing another faux pas that will see his soon-to-be-completed sentence extended by another ten years. This is pretty dire stuff, but it’s not as bad as Driven and it has some entertainment value, even managing to notch up a level of suspense in the final couple of reels. It would have worked better if Sly had been slightly damaged to start with so that he had some internal demons to deal with as well as the ones outside his cell. As it is, he’s the world’s nicest prisoner, which means he’s completely one-dimensional. The story itself tosses logic aside with arrogant disdain. In the end, Sly takes Don hostage and ties him into the electric chair the warden has so lovingly restored (see what they did there? Car = symbol of freedom, electric chair = symbol of death. Clever stuff, eh?). What nobody knows is that Sly has taken the fuses out of the switch so that when he pulls it nothing happens. Somehow, this is enough to convince the guy who played Kunta Kinte that Sly’s telling the truth and all ends happily with everyone forgetting that he’s just submitted another human being to an ordeal that would warrant a prison term regardless of whatever unrelated crimes his victim had committed.